Win £60 for Tottenham’s first Champions League tie with Today’s Enhanced Offer! Wager £10 on Tottenham to win against AS Monaco in tonight’s Group E of Europe’s elite football competition and win six times your investment! Today’s Enhanced Offer on the Spurs is valid only for today, so make sure to bet before the start of the game (19:45 BST) to maximize your earnings! You’ll receive your earnings – if Tottenham win the match – based on the standard odds on the site, while the other part of the winnings will be given to you in Free Bets. This will take the total odds to the advertised 6.00 (5/1) with Today’s Enhanced Offer! 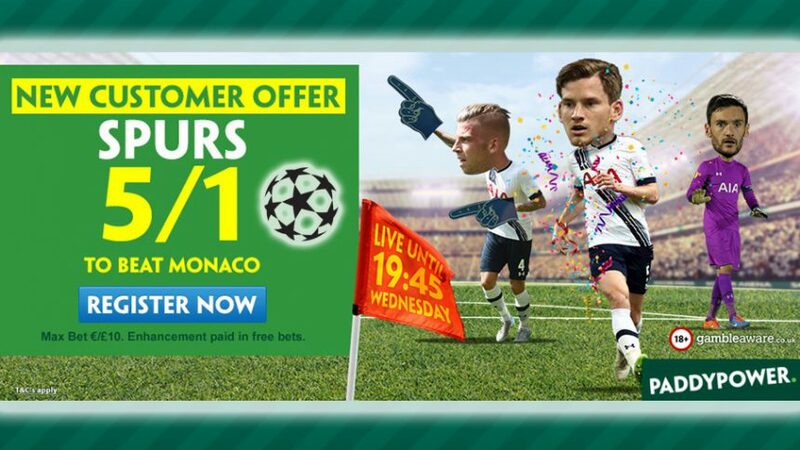 Open a new account today and back the Spurs to clinch a win over AS Monaco with Today’s Enhanced Offer 6.00 (5/1)! This season, Tottenham will play their European games at Wembley Stadium, as their regular home – White Hart Lane – is currently undergoing expansion, which will increase the ground’s capacity from 36,000 to 61,000. Once completed, the new White Hart Lane will boast a greater capacity than that of their rivals Arsenal by just a few hundred, whose Emirates Stadium currently offers 60,432 seats. Tottenham are the favourites to win the game, although they might struggle at first to adjust themselves to Wembley’s pitch, which is significantly bigger (105m by 69m) than the one they’re used to playing on (100m by 67m). But considering that Wembley can boast 90,000 spectators – with the vast majority expected to be Spurs fans – Mauricio Pochettino’s men will enjoy great support as they aim to kick off their European quest with a victory against the wealth of AS Monaco. “It was impossible to have more training sessions at Wembley, but I’m happy. Maybe it’s a little bigger than White Hart Lane but in the end it’s football, so we need to enjoy it and play better than Monaco,” the Spurs boss commented. Open a new account with Paddy Power today and place a bet on Tottenham to beat the French side with Today’s Enhanced Offer! Bet on Spurs with Today’s Enhanced Offer!